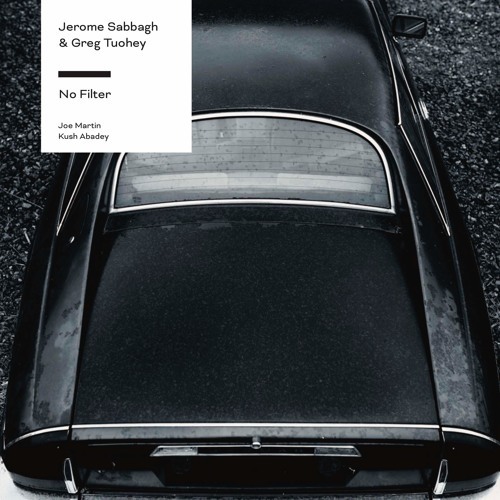 2 songs from the upcoming "No Filter" (Sunnyside Records) by Jerome Sabbagh & Greg Tuohey Vicious (Sabbagh) No Road (Tuohey) Jerome Sabbagh: saxophone Greg Tuohey: guitar Joe Martin: bass Kush Abadey: drums Jerome Sabbagh & Greg Tuohey - No Filter Back in 1995, saxophonist Jerome Sabbagh and guitarist Greg Tuohey were recent international transplants in New York City — Sabbagh from Paris, France, Tuohey, from Auckland, New Zealand. They both threw themselves into the city’s vibrant scene, playing with talented peers like Mark Turner, Ben Monder, Ari Hoenig and many more. Along with bassist Matt Penman and drummer Darren Beckett (international transplants themselves), Sabbagh and Tuohey formed the collaborative group Flipside, releasing an acclaimed eponymous album on Naxos in 1998. After the release of that album, however, the pair went their separate ways musically, while remaining close personally. Sabbagh went on to record a string of highly regarded solo albums, including “The Turn”, with his longtime quartet of Ben Monder, Joe Martin and Ted Poor, an album which was selected among the best records of 2014 by the Boston Globe, LA Times, DownBeat, France Musique. He also played with drummer Paul Motian for the legendary drummer’s final Village Vanguard shows. Tuohey mostly left the New York jazz world, working as a session and touring guitarist for rock groups, including indie singer-songwriter Joe Pug. In 2010, Tuohey returned to improvised music and released his debut album as a leader, “First”, in 2013. He is also part of Aaron Parks' newest project, Little Big. Tuohey and Sabbagh have now reconnected musically to form a quartet that showcases their own original compositions. The top notch rhythm section consists of the much sought after bassist Joe Martin, currently playing in the quartets of Mark Turner and Chris Potter, and the great young drummer Kush Abadey, who has been making a name for himself playing with Ravi Coltrane, Wallace Roney and many others. The band recently recorded their first album, “No Filter”. Building on the success of “The Turn” in the audiophile community, Sabbagh, an audiophile himself, and Tuohey decided to record to tape and press AAA vinyl. Like “The Turn”, “No Filter” was recorded all in a room at Sear Sound in New York without headphones live to two track half inch analog tape at 30 ips by engineer James Farber. It was mastered and cut to vinyl by mastering legend Bernie Grundman. The all analogue LP was pressed at QRP. "No Filter" is also available as high resolution and regular downloads.